Why not try a poem? We’ve got new ideas to share — we’ll show you in a wink! April begins next week and it is National Poetry Month in the USA. Here at Edublogs, we’re declaring it International Poetry Month! 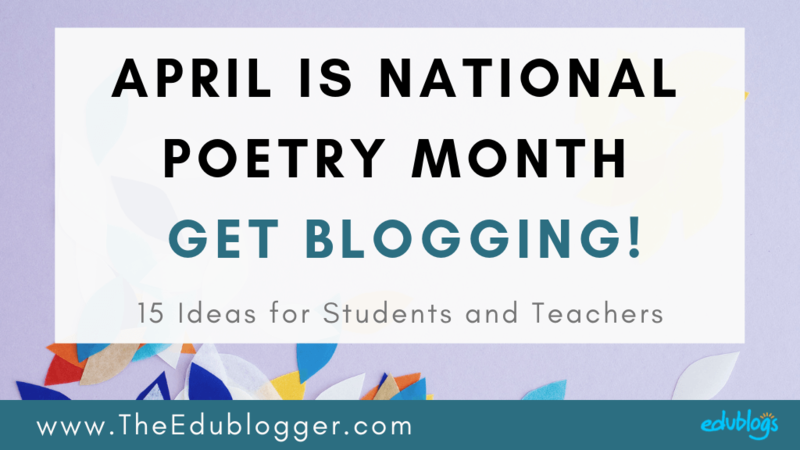 Thank you to Sheri Edwards who blogged about National Poetry Month recently and shared some great ideas. Be sure to check out Sheri’s original post here and her follow up “Poetry Invitation” that has even more poetry ideas. 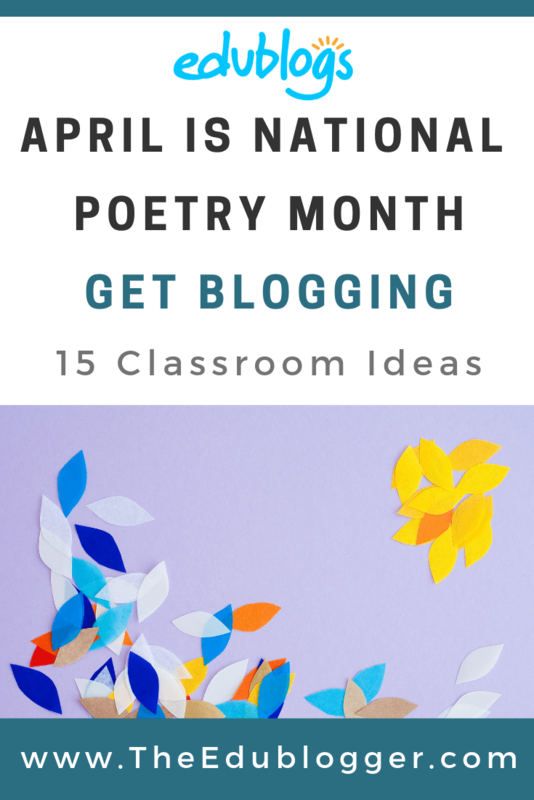 This post explains what Poetry Month is all about and we share 15 ideas for incorporating poems into your blog posts — in April or at any time of the year! National Poetry Month has been held every April since 1996. It’s the largest literary celebration in the world. Tens of millions of people including students, teachers, and librarians celebrate poetry’s important place in our culture and lives. 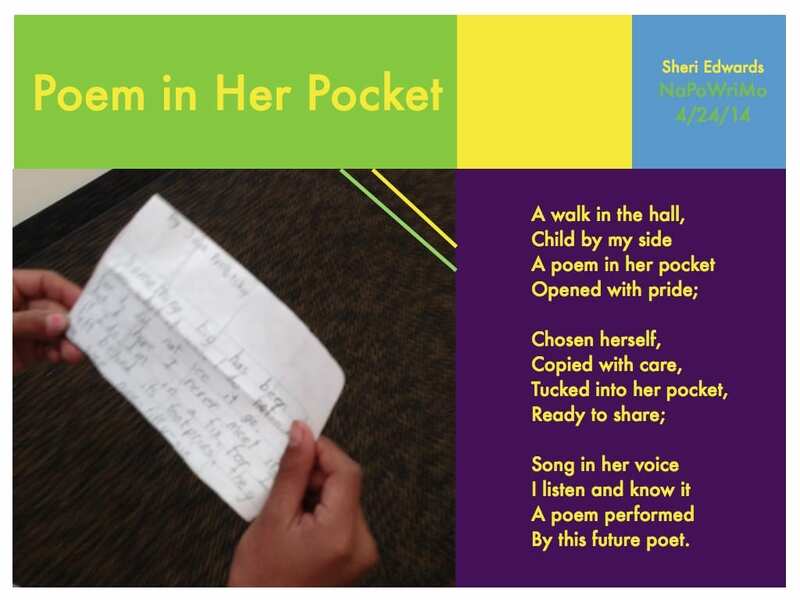 A really fun part of Poetry Month that Sheri always enjoyed celebrating with students is Poem In Your Pocket Day. This special day will be held on Thursday April 18. There’s a great list of 30 ways to celebrate on the National Poetry Month Website. While memorization may seem like a relic from your school days, the rewards of recalling a private anthology of well-loved poems are both immediate and long-lasting. Find tips on memorizing poems here. Let’s support our local poets and booksellers, wherever we live in the world! Perhaps you could even invite a local seller to a school community event. Of course, this is our very favorite way of celebrating Poetry Month! 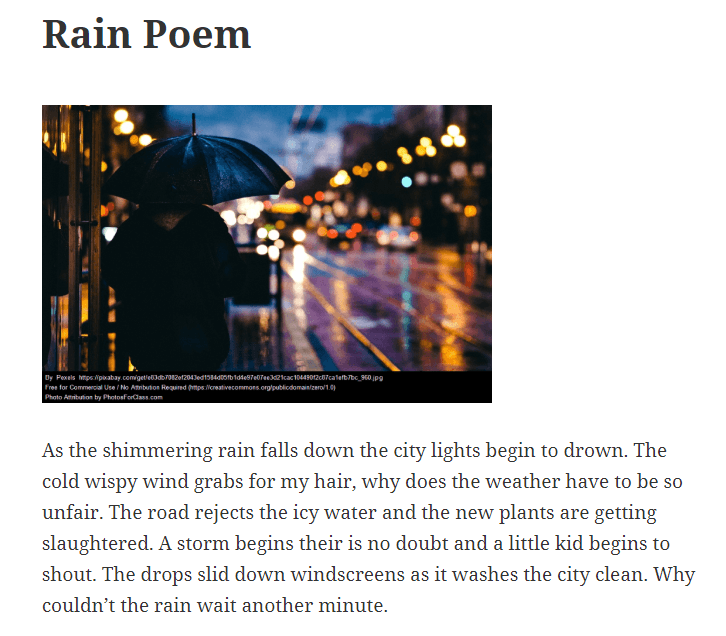 Whether you’re an educator or student, a blog is an ideal way to publish poems. And there are so many creative ways to go about it. Let’s take a look at some ideas! 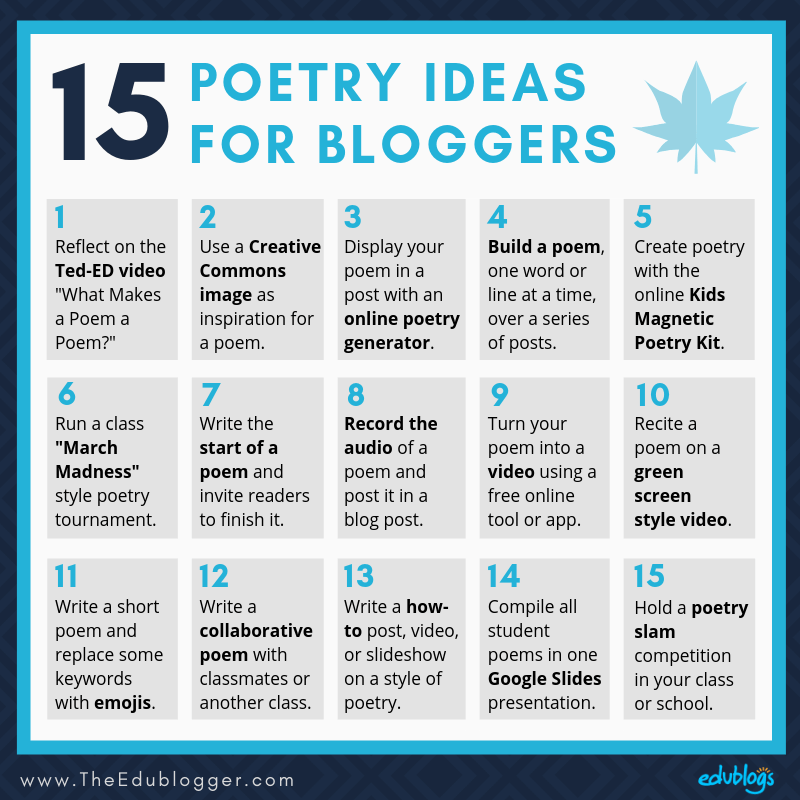 Want some practical ideas to incorporate poetry into blogging? Here are 15 to get you started and we’d love you to share your own ideas in a comment! 1) What Makes a Poem a Poem? There’s a lesson on TED-Ed that sets the scene for looking at poetry. You could embed it on your blog and ask readers to share their reflections. Find the video here on YouTube to embed it. Find the lesson notes on the TED-Ed site here. Insert a Creative Commons image in a post and use it as inspiration for a poem. Need some inspiration or advice? Check out Ken Nesbitt’s site which has lots of poetry resources. Find out all about using Creative Commons images and the easiest sites to use in this Student Blogging Challenge post. Here’s an example post from 11 year old Molly in New Zealand for the Student Blogging Challenge. She got her photo from Photos for Class (a great site for young students!). Sheri Edwards also has some poetry examples in this blog post. Explore the fantastic poetry generators on the Language is a Virus website. Over a period of a month, teacher-blogger Kevin Hodgson creatively released a poem — one word a day. Perhaps you could try this over a set period of time. Or, instead of words, you could write the first line of a poem in a post and then build on it over subsequent days in new posts. Use this free online Kids Magnetic Poetry Kit to create a poem. Take a screenshot of your end result and add it to a blog post as an image. You could even add an image of scrambled words and invite readers to unscramble them in a comment. Have a ‘March Madness’ style poetry tournament in your classroom. Find out how this works here. The poems could be displayed on blog posts and the voting could take place via a Google Form or simple polling tool like Crowd Signal. You could make a class display of your tournament with sticky notes as illustrated in this tweet from Lucinda VanGlahn. Ms. Hunter incorporated QR codes into her display. You could even use QR codes to link to a blog post where students read poems aloud! Write the start of a poem and invite readers to finish it in a comment. Perhaps you could even include a variety of short poems and visitors could write the ending for the poem of their choice. Another idea is to write your poem with some different variations or endings and invite your readers to vote for the favorite. They could vote by leaving a comment, via a Google Form, or through a simple polling tool like Crowd Signal. Record the audio of a published or original poem and add it to a blog post. You could use a free tool like Anchor. Richard Byrne has created a short screencast to demonstrate how to embed an Anchor podcast into an Edublogs blog. Note: If you don’t want to work with the text editor as demonstrated above, you can just click on Add Media > Insert Embed Code > Insert Into Post. If you need more help with embedding an HTML code, check out these instructions. Know any other good free web tools or apps? Leave a comment! Here’s an example of a digital poem from Kevin Hodgson using Lumen5. Read about his inspiration and process here. Using an App like Green Screen by Do Ink, you could recite a published or original poem on a video and use your own illustration as a background. Here is an example from 4th grade teacher Roya Azimi. You could also use the app to add an illustrated object to your poetry video as demonstrated by Jennifer Carlson’s 1st grade student. Write a short poem and replace some keywords with emojis. It might be nice to create this in a program like PowerPoint, Google Slides/Drawings, or Canva and save your work as an image. Then add it to a blog post. Not sure how to add emojis? On a Mac, you can use the keyboard shortcut of Control + Command + Space to bring up the emoji selector. 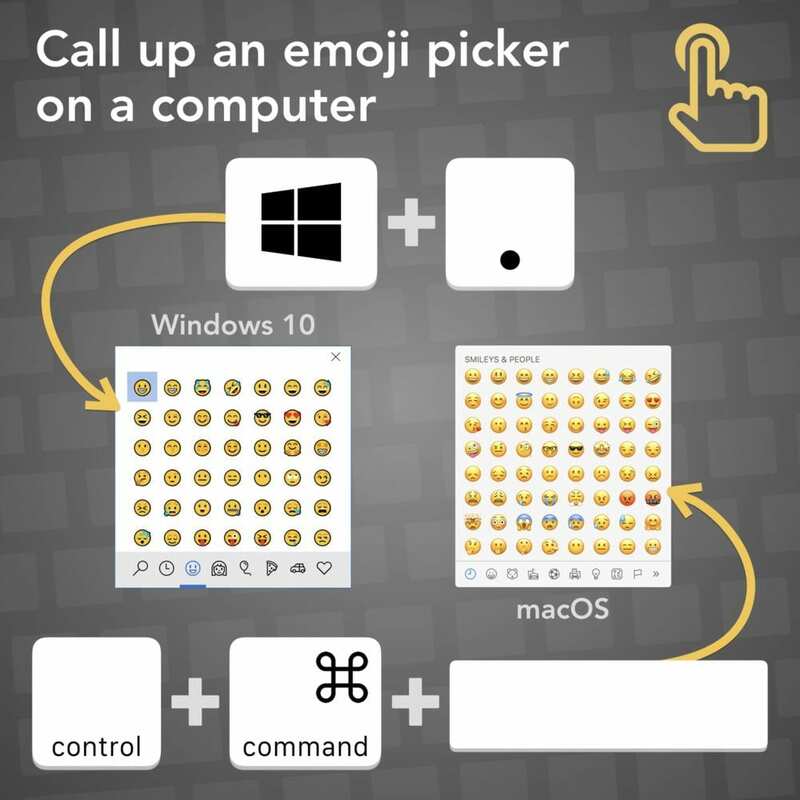 Find more tips for working with emojis on Tony Vincent’s website. Two heads can be better than one so why not write a collaborative poem? Students could pair up and do this with another student. Alternatively, classes (near or far) could pair up and construct a poem together. You could use a shared blog or Google Docs to take it in turns to add a line to a poem. The published piece could be displayed in a blog post. Write a how-to to demonstrate how to construct a style of poetry such as haiku, cinquain, limerick etc. Look at Kenn Nesbitt’s ‘how-tos’ for simple written examples. You could bring your tutorial alive with images, a video, or a slideshow. Your students can write poems the old fashioned way on paper (and take a photo) or in a Google Slides presentation. You can then bring them together in one Google Slides presentation and embed in a blog post. I once made haiku poems with students and collated them in a Google Slides presentation. I used the instructions from Erintegration to combine multiple slides into one large slideshow. Hold a poetry slam competition where volunteer students are filmed performing their original poetry and blog viewers can vote or comment. For inspiration, check out this video where 12 year old Solli Raphael became the youngest winner of Australian Poetry Slam. Also, check out this TED-Ed video ‘Become a slam poet in five steps‘. Want even more ideas? Remember to check out “Poetry Invitation” by Sheri Edwards. What ideas do you have? How will you be celebrating poetry in April? We’d love to hear your ideas in a comment. If you publish any blog posts, be sure to share the link with us too. You can put it in the comment box below or tweet us, @edublogs. I didn’t know April was April was national poetry month! Teaching poetry to 6th graders has always begun with groans and eye rolls. By the end of our unit, students are clamoring for more poetry. Poems are perfectly proportioned for the students who feel in control guiding the flow of words. The freedom from conventions meets them right where they dwell. I am continually inspired by the whimsy of odes to french fries, I would never thoughts, and the rapier wit shared every April. This year I hope to share through our blog. I use Wakelet, https://wakelet.com/ to house my resources students will use, and let all of them loose to learn. Thank you for the suggestions in this post! Funnily enough, I have had the exact same experience with grade 4 students. There were eye rolls at the start of the unit but they ended up loving it and producing amazing work! Using Wakelet is an excellent suggestion. For those teachers who have never heard about this great tool, I’ve written a guide to getting started here. I bet you’re going to have a lot of fun during April! Poetry was always a challenge for me… but once I realized it wasn’t about the format, I got past that stumbling block. I usually try to write poems when I’m in one of those emotional spaces, or it just doesn’t work for me. Thank you for sharing your inspiring post. I’m sure others will enjoy reading it! I really like your work. It’s very interesting and creative. You should be very proud of your work. I hope you got some ideas, Ashley! On my Write Club blog, I almost always post poetry. It speaks to my soul and cleanses my frustrations away. To all those wanting to celebrate National Poetry Month and not knowing how to start a poem, my advice is as follows: listen to your emotions and never, EVER force anything. Great poetry comes from the heart. It comes from when you’re too depressed to get out of bed and you’re angry at yourself for not getting up anyway. It comes from the confusion of unrequited love. It comes from self-deprecation. All those feelings swirling inside you – even humor – can create a poem. What you need to do is learn to let those feelings speak. Never force them to speak, for they will always run into the shadows, never to be seen again (trust me). Just invite their presence and they will come. If not, then go for a last-resort: your frustration about poet’s block. I’ve written quite a few of those. They have been some of my strongest poems.